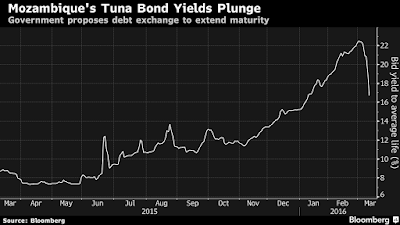 Bonds of Mozambique’s state-owned tuna-fishing company gained the most on record after the south-east African nation proposed to exchange almost $800 million of debt for longer-term securities in a bid to reduce annual interest payments. Yields on the the $773.5 million of sinkable bonds, guaranteed by the sovereign, fell 2.4 percentage points to 16.72 percent by 10:28 a.m. in London after dropping 173 basis points on Wednesday. That boosted the price 4.9 percent to 80.2 cents to the dollar, from 75 cents on Friday, the biggest gain since the debt was sold in September 2013, according to data compiled by Bloomberg. The maximum price of the new fixed-rate notes to replace the securities of Empresa Mocambicana de Atum SA, or Ematum, will be 80 cents on the dollar, the government said in a statement Wednesday. The new bonds will be issued by the government and mature in 2023, compared with the 2020 maturity of the existing debt. Other details about the the debt exchange, including the prices and interest rate, will be announced on March 17. There will be $697 million of debt outstanding once Ematum makes interest rate and coupon payments on March 11, the government said. Credit Suisse Group AG and VTB Capital Plc are arranging the exchange offer. 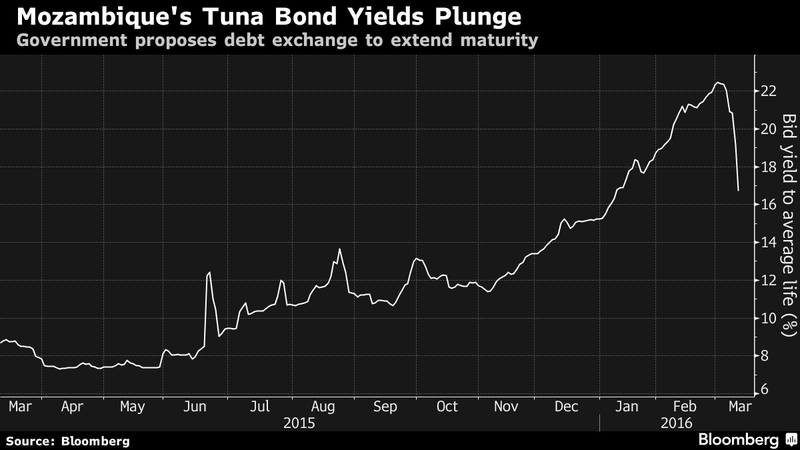 The bond was originally a loan from the two banks for the purchase of tuna-fishing boats. It was then packaged into so-called loan participation notes and sold to global bond investors. 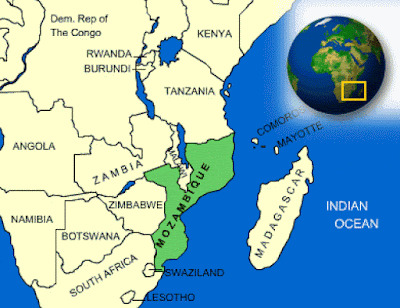 Mozambique, one of the world’s poorest countries, is struggling to pay its debt amid a cash crunch as slowing growth in China reduces revenues from raw materials including coal, and the depreciation of the metical boosts the dollar-based debt-service costs. The International Monetary Fund agreed to give the nation $286 million of emergency aid in October, while the central bank restricted how much Mozambicans could spend abroad on credit cards to bolster the currency. Standard & Poor’s said Feb. 5 that it would view any restructuring that included an extension of maturity dates or a reduction in principal as tantamount to a default that may result in a downgrade in the country’s credit rating of B-, six steps below investment grade. Others bondholders include AllianceBernstein LP, which has almost $30 billion invested in emerging markets, Danske Bank A/S, Franklin Templeton Investments and Goldman Sachs Group Inc., according to data compiled by Bloomberg. Danske said in December it may back a plan to exchange the Ematum bonds for a new interest-only sovereign note maturing in about 10 years. 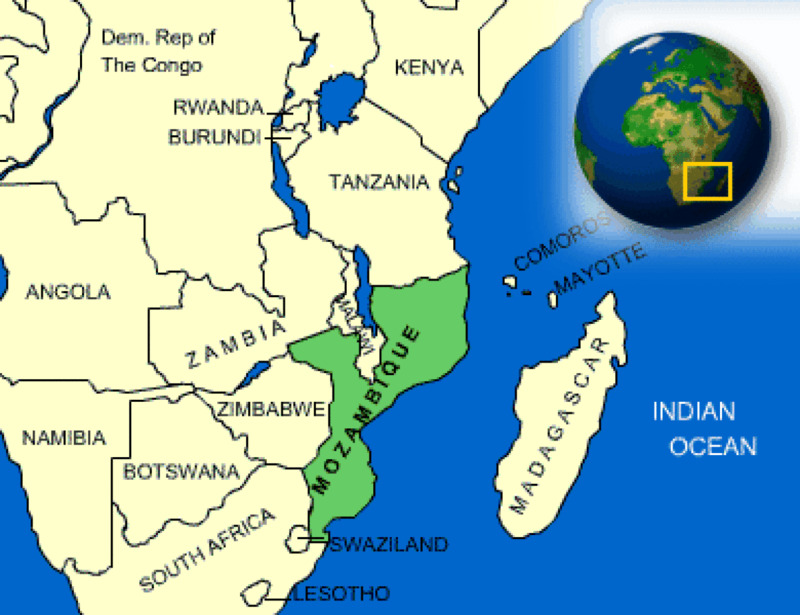 By then Mozambique is expected to be exporting natural gas, which Standard Bank says could lead to the economy expanding nine-fold by 2035.